In the last few years, scientists and researchers discovered that elephants, like cetaceans, not only learn how to imitate sounds, they can communicate across vast distances. Some of that communication exists beneath the level of human hearing. These infrasonic communications occur in all three species of elephants at lower than 20 Hz, the bottom level of what people can hear. Because low frequency sounds travel much farther than high-frequency emissions, infrasonic communications can travel up to several miles across land. Most biologists agree that elephants are the whales of the land, not only in their size, but in their close-knit social groups and the ways in which they communicate with each other across large distances. After elephant researcher Joyce H. Poole of the Amboseli Trust for Elephants in Kenya noticed that a female elephant appeared to imitate the low frequency sounds made by trucks lumbering across the terrain miles away, she compared her findings with colleague Angela S. Stoeger-Horwath of the University of Vienna. Stoeger-Horwath witnessed a male African elephant imitating the sounds of two female Asian elephants at a zoo, even though they were different breeds. When Poole and Horwath compared their findings, they decided to contact a noted cetacean biologist at the Woods Hole Institute in Falmouth, Massachusetts for greater understanding. Their work with cetacean biologist Stephanie Watwood at the Institute helped them discover the similarities between whale and dolphin vocal interactions with those of elephants. As an uncommon ability among most animals, Watwood reviewed the recordings and data of the elephant communications and discovered that like whales and dolphins, elephants can "learn" sounds and imitate them. Elephants, like dolphins and whales, show signs of intelligence and empathy. Elephants are known to help other suffering elephants, feel emotions similar to those of humans and grieve for their dead. National Geographic reports scientists have witnessed elephants removing tranquilizer darts from their companions, spraying dust on other's wounds and working together to free calves stuck in mud. Elephants help dying friends, urging them up while calling out in agony. In an African elephant refuge, caretakers and researchers watched as one female, frightened by a snake in the grass, received comfort and soothing from other elephants in the herd. They heard low rumbles, chirping and other forms of comforting communication. They learned that elephants in distress communicate to herds miles away to warn them of coming perils. American zoologist Katy Payne, while observing elephants trumpeting and rumbling to each other at the Washington Park Zoo in Portland, Oregon, also noticed that there seemed to be sounds that she could also feel, like those emitted from a sub-woofer, below the sounds she could hear. Suspecting infrasonic sounds, she contacted many other elephant researchers with her discoveries, including Poole, which led them all to conclude that they use these deep infrasonic sounds to communicate at great distances. Atmospheric conditions also play a huge part in how far infrasonic communications can travel. In dry evening conditions in the Savannah, the listening area increases exponentially, often up to 186 square miles when compared with midday listening areas of about 18 square miles. 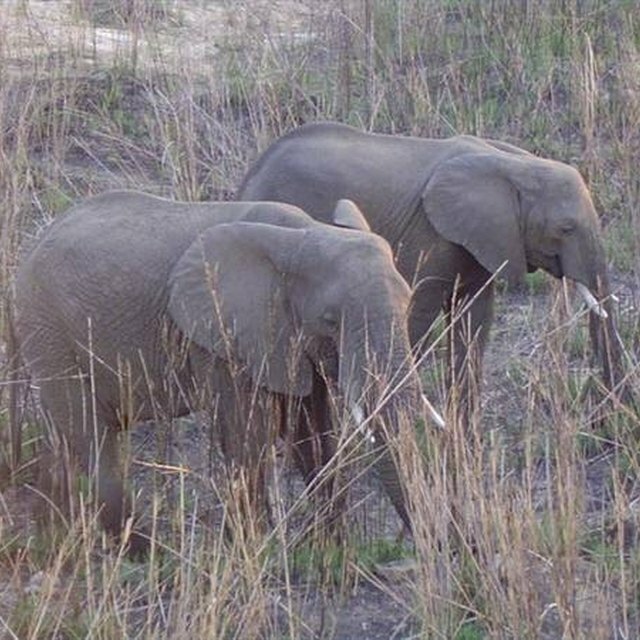 Biologists, zoologists and other researchers who participate in the Cornell University's Elephant Listening Project posit that elephants use infrasonic and audible-to-human sounds to organize family and herd behaviors, to announce mating season, share information about resources and to warn of impending dangers to herds far away. They discovered that while most infrasonic communications take place among family groups, females often vocalize much more than bull and young male elephants. Elephants, like cetaceans, make a variety of noises and sounds when they communicate. They scream, trumpet, rumble and chirp. Rumbles typically include the low-frequency sounds, more than likely felt by humans than heard. These rumbles typically fall between 5 and 30 Hz and include audible harmonics, a component overtone. The higher frequency noises weaken at a greater rate than the lower frequency sounds, which is why lower frequency sounds travel farther. Harmonic ranges for elephant rumbles vary from 5 to 250 Hz, with the lowest forest elephant call marked at 5 Hz and 14 Hz from elephants living in the African Savannah. Elephants and dolphins share a brain structured similarly to that of people. The indications of a highly developed and complex neocortex in both elephants and dolphins places them in a higher intelligence category than other animals. Among scientists, the convoluted structure of their brains indicates a complex intelligence. Elephants like dolphins and apes, can think and use tools to achieve their desired ends. Kandula, an elephant in the National Zoo in D.C., came across some bamboo (that had been left for him to see how he would respond) that had bits of melon attached to it overhead. After easily eating the low-hanging fruit using his trunk, the scientists noted the elephant had an epiphany after spotting a cube in the yard. He pushed the cube from across the yard to underneath the suspended food. He used it to step up and reach the rest. Once he learned the secret means of reaching this suspended food, he repeated it with other useful objects left in the yard by the scientists to test him. These tests revealed the elephant also used blocks and tractor tires left in the yard to achieve the same ends. Scientists, biologists and zoologists freely admit that there is much more to learn about elephants and that maybe it's time to rethink how they're caged and treated. Brenner, Laurie. "The Secret Language of Elephants." Sciencing, https://sciencing.com/the-secret-language-of-elephants-13711535.html. 25 June 2018.